Browse Our Various New and Used Material Handling Equipment Categories Below Below are some of the most common requests by our hundreds of industrial and warehouse customers. Due to the fact that we are updating our website to deliver instant notifications of new warehouse storage systems, much of our current inventory may not be listed on the website. To begin receiving immediate notifications on new and used material handling and storage systems you need as they come into stock, call us at 877-741-6711 or fill out our contact form here. As a warehouse material handling equipment supplier, we supply New and Used Material Handling Equipment solutions for the distribution and fulfillment industries. Products include new and used pallet racks, case conveyors, pallet conveyors, gravity conveyors, sortation systems, carousels, carton flow rack, pick modules, pick to light systems, shelving, mezzanines and forklifts. 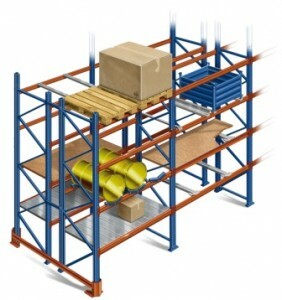 We can design, build and install custom material handling systems for you. The warehouse storage systems we offer can handle drums, cartons, containers and pallets. Call us and let us know what you need to be handled. To view our used equipment database click here.